ASOC Singers and Friends: Peachtree String Quartet at Eddie's Attic! ASOC Singers and Friends! Ever wonder how the ASO musicians feel about you? You are invited to find out! 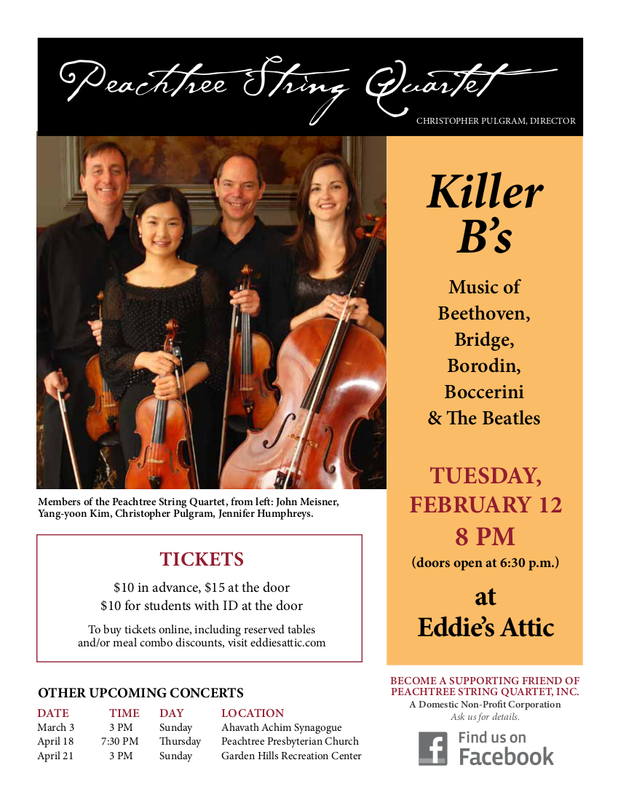 The Peachtree String Quartet is performing at Eddie's Attic -- This Tuesday -- on Feb 12 ... featuring music from all the 'Killer Bees' (see flyer below). Of particular interest to the singer-persuasion is a sing-along medley of Beatle songs, dedicated to the group who has always stood -- literally and figuratively -- behind the orchestra: the mighty ASO Chorus. So brush up on your Rubber Soul and come out for a great night of music. Your 'Music is Ongoing' t-shirt counts as a student ID. Wear it to get the $10 student ticket!